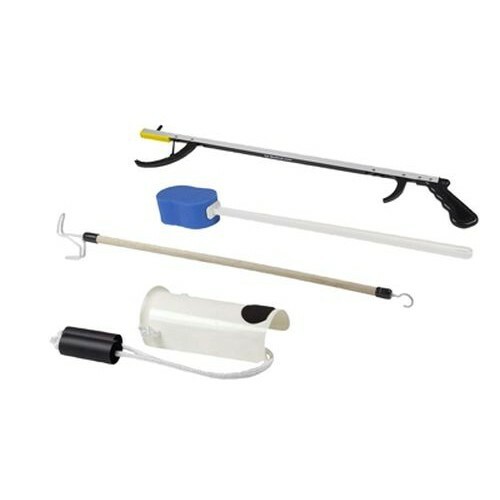 26 or 32 Inch Reacher: Allows you to pick items off the ground without bending over. Also extends reach in general to grab things far away from you with ease. Sock Aid: This is an easy to use formed sock aid with two handles to assist you in putting your socks on. Contoured Sponge: These sponges feature a long handle to help reach your back and lower extremities. You will be able to get those spots on your own now. 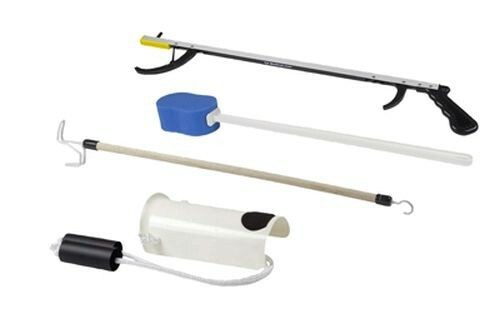 24 Inch Dressing Stick: Getting dressed just got easier. Use the hooks to assist you in putting on shirts, pants, and jackets as well as adjust zippers. Some kits also include either a 24 inch metal or 18 inch plastic shoe horn to help easily put your shoes on.